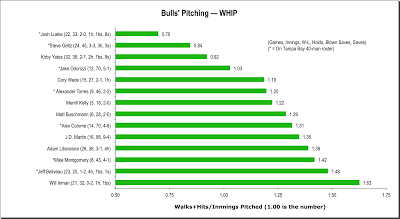 The break gives me a chance to update some of my pitching/pitcher charts. 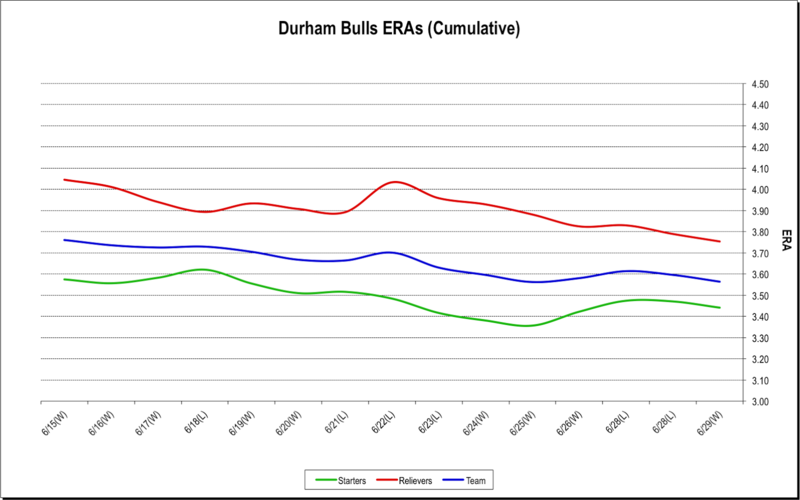 The Bulls pitching crew has been subject to considerable turmoil this year. An outrageous 42 of the roster transactions to date have involved pitchers (so far — the day is young). 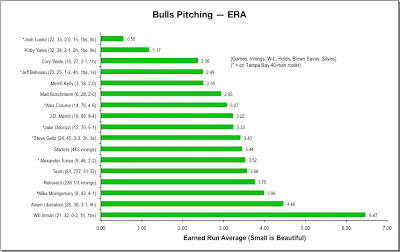 Nevertheless, when you look at the team over the last 15 games we have a nice downward trend in ERA (and won 9 of the 15). 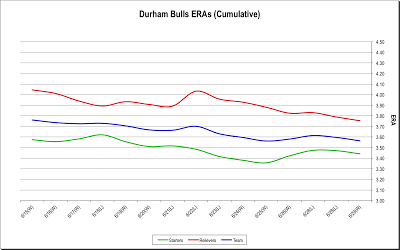 There is a spread between the starters and relievers, but it’s only about ⅓ run per game and almost entirely with the middle relief crew (and the Bulls have had to go with two “bullpen” games in the period). Click on any of these to get a larger, more legible version. 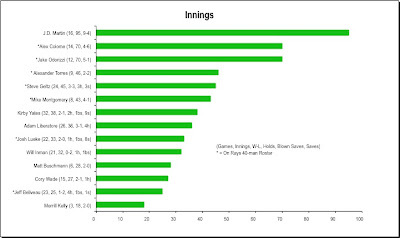 It seems odd to have to warn about small sample size at this point in the baseball year, but here it is. 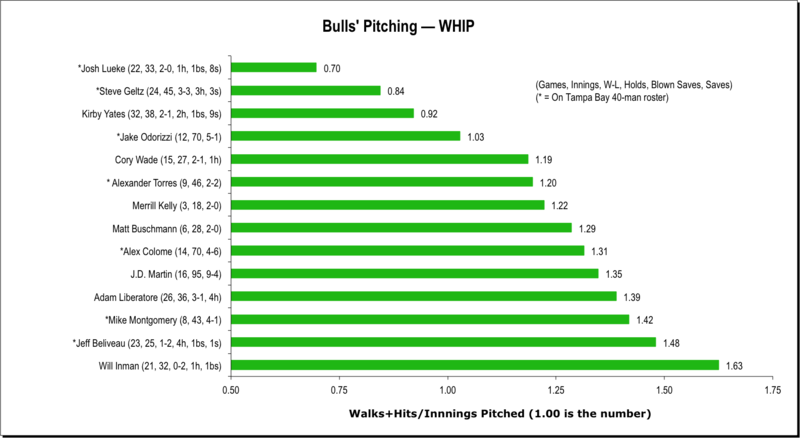 Some of these guys really don't have much time with the Bulls. Every pitcher on this list that’s on the Tampa Bay 40-man has been with the Rays. One of them, Alexander Torres, is still there. Not sure when or if he’s coming back, but I left him on for the moment. 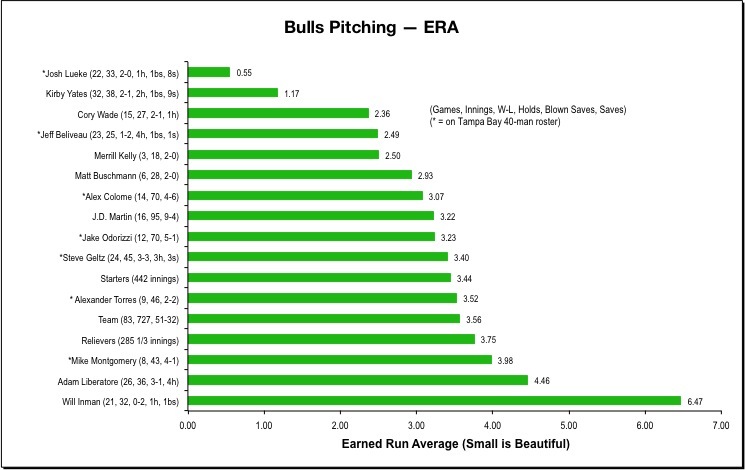 The ERAs below are pretty good, Lueke and Yates are exceptional and their combined 17 saves says a lot about why the Bulls have done well this year. Will Inman has had some physical problems, as has Mike Montgomery. Pretty sure that Montgomery is settling down. Not so sure about Inman. But very hard to tell. The WHIPs of the crew are mostly pretty good as well. Obviously Liberatore and Inman are worrisome. A new guy, C. J. Riefenhauser, just came up from Montgomery. He may balance things out. Not sure why either Inman or Liberatore didn’t go to Montgomery instead of Sandoval. Probably just another instance of my not understanding minor league contractual concerns very well.